When it comes to Gadgets, Smart Devices and New Technology, there is a strong upgrade culture in Singapore, according to the latest Text100 Digital Index: APAC Consumer Electronics Study. Singaporeans are a materialistic bunch, and generally relatively affluent. With that, comes spending power and in keeping up with the latest trends. When it comes to gadget or technology shoppers, Results showed that nearly half of the respondents will purchase a new product to “stay trendy” (49%) and “because it’s new” (47%). That’s quite true. That aside, perhaps you would also expect increases such as online shopping, mobile technologies, and a whole range of other new trends to have changed the way we buy things. And you’d be right. But in a surprising number of areas, our purchasing habits are best described as “same-same but different”. Online advocacy – not the whole picture? It is quite a spot on and in-depth analysis, with pretty good insights into the tech shopper mentality. 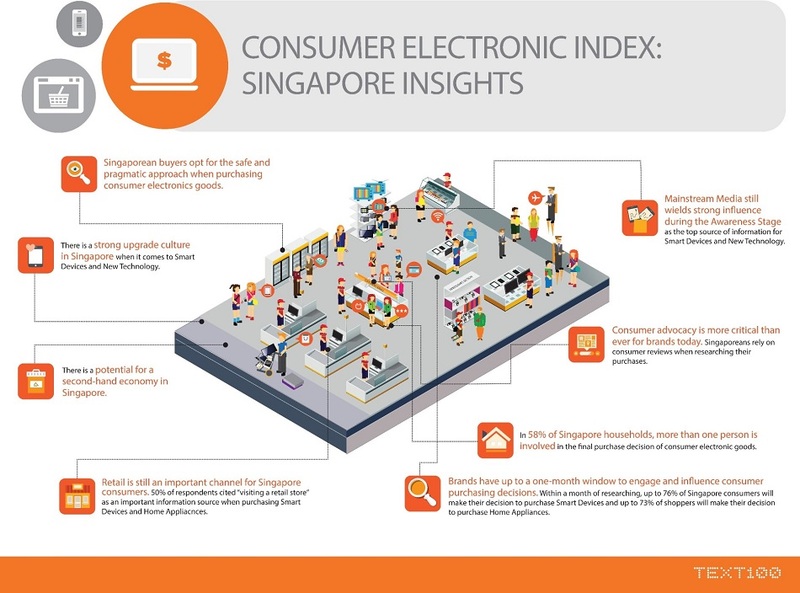 Despite Singapore’s love affair with new devices, the findings show that majority of buyers in the Republic opt for the safe and pragmatic approach when purchasing consumer electronic goods. When Singapore respondents were asked about their view of technology, “long lifespan of devices” and “most happy with tried and tested” were indexed the highest. Looking at the numerous Apple and Samsung adopters, that’s pretty much apparent too. The study also found that despite the dominance of online channels at the start of consumers’ decision-making process, brick-and-mortar retail outlets remained a trusted source of information from initial research to purchase and beyond, with their function changing depending on where the consumer was in their buying journey.